Why choose the London Gamma Knife Centre? We are able to offer patients the latest generation of non-invasive treatment for brain conditions. The Gamma Knife Icon is a precise and accurate way to deliver radiation to even the most complex brain tumours or abnormalities. This painless treatment, which has many advantages over traditional surgery, does not require a general anaesthetic and involves only a single day outpatient visit. Most patients experience only minimal side effects and return to their normal activities the following day. As a patient of the centre, you'll benefit from the expertise of a multidisciplinary team of specialists, ranging from oncologists to neurosurgeons and radiographers, all working together to make sure you receive the best possible care, tailored to your condition. Our purpose-built centre is located at the Platinum Medical Centre in St Johns Wood, part of The Wellington Hospital. A type of benign brain tumour that develops in the membranes covering the brain and spinal cord (meninges). Also known as an acoustic neuroma, a tumour that grows slowly from the covering on the vestibular nerve. A complex interweaving of blood vessels in your brain with abnormal connections between your arteries and veins. Involuntary movement or shake that affects parts of the body, and a main symptoms of Parkinson's. Gliomas are brain tumours starting from the glial cells, which support the neurons/nerve cells in the brain. In fact, it is not a “knife” at all. Radiosurgery is a safe, effective and non-invasive procedure using radiation to treat tumours. It can replace conventional surgery combined with radiation, or it can be used in conjunction with it. Radiation is delivered with precision to the abnormal tissue, within either the head or neck, to tumours, vascular malformations and nerves. With radiosurgery there is very little risk of infection, almost no risk of bleeding and no risk of spinal fluid leakage. As there is no need for invasive surgery, treatment can usually be delivered in a single day with most patients experiencing minimal side effects and returning to their normal activities almost immediately. The Gamma Knife system was the first ever radiosurgery device and works by damaging the cells so they can no longer grow. 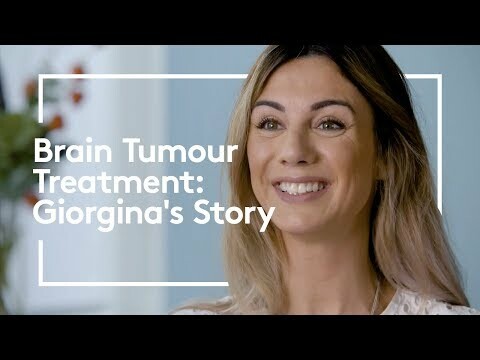 It has revolutionised the treatment of certain benign and malignant tumours in and around the brain, replacing the need for surgery in many cases. Unlike conventional radiotherapy, radiosurgery is only directed at the abnormal tissue and so it spares the unnecessary treatment of normal brain tissue nearby. Why choose the icon technology? Although Gamma Knife treatment has been in use for over 30 years, over the years technology has advanced at tremendous speed so that we can now treat brain tumours with unbeaten precision and accuracy. In order to deliver beams of radiation with submillimetre accuracy, the patient’s head must be held securely to avoid inaccuracy due to movement and here the Icon offers more flexibility than earlier machines. For earlier Gamma Knife models, a frame is used to prevent head movement during treatment and allow for precise delivery of radiation. The Icon also adds the option of using a standard radiotherapy mask. The Gamma Knife has a proven track record over 30 years and has become the gold standard for the treatment of many benign tumours which would previously have required surgery and also for multiple brain metastases previously considered untreatable. “in 2006 Mr Ian Sabin saved my life with brain surgery at The Wellington, so honoured to open the new centre which continues to save lives." The Gamma Knife can be used to treat a range of brain conditions including benign tumours (vestibular schwannoma, meningioma, pituitary adenoma and other skull base tumours) and malignant tumours such as metastatic tumours and glioblastomas. It also treats a range of neurological disorders such as vascular disorders including arteriovenous malformations (AVMs), cavernous malformation and dural arteriovenous fistula. Movement disorders such as epilepsy, parkinson’s tremor, OCD and trigeminal neuralgia (severe facial pain) are treated by the Gamma Knife. Using this new equipment, our multidisciplinary team of neurosurgeons, oncologists, radiologists and physicists can target and treat conditions with higher accuracy than any other system, within 0.5mm, enabling our consultants to deliver a high dose of radiation to the affected areas, reducing the dose to the surrounding healthy brain. The design of the gamma knife also means there is much less radiation delivered to the rest of the body and because it is a minimally invasive procedure there is no risk of bleeding or infection. The treatment process consists of four steps. First of all you will have a frame/or mask fitting followed by a CT, MRI or angiography. After your diagnostic imaging, you will rest whilst your medical team plans your treatment followed by the treatment itself. You can have treatment in a single day, and after a short recovery time you can return to normal activities almost immediately. The London Gamma Knife Centre is based at the Platinum Medical centre which is part of The Wellington Hospital in St Johns Wood.